Leading Questions Forming Basis of Appeal - В сложной финансовой ситуации приходит на помощь кредит наличными в Казахстане. During a direct examination at trial, a party will always tiptoe on the fine line of asking the witness leading questions in order to elicit the desired testimony. 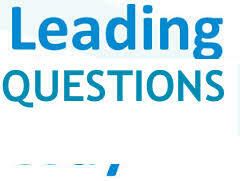 Leading questions, in most circumstances, are objectionable during direct examination because it allows the lawyer asking questions to basically testify while leading the witness to the answer he or she is seeking. Look, a lawyer will ask leading questions if he/she can get away with it—until the trial court sustains objections. But, just because a trial court sustains an objection does not necessarily mean the lawyer will stop asking leading questions during direct examination. If a lawyer can get away with leading a witness during direct examination to elicit the testimony needed, the lawyer will do so and probably should do so. When do leading questions in a civil trial become so over-the-top to warrant a new trial? They really do not! “[L]eading questions do not result in an error that will warrant a new trial.” Moore v. Gillet, 96 So.3d 933, 944 (Fla. 2d DCA 2012). In Moore, during the defense, direct examination of a treating doctor was being conducted. The doctor was serving as a defense witness. The trial court sustained numerous objections that the defense was leading the defense witness. At some point, and despite there not being an objection or motion for mistrial by the plaintiff, the trial court terminated the defense’s questions of its witness due to the persistent leading questions. At the conclusion of the trial, the trial court ordered a new trial upon motion by the plaintiff. One of the reasons the trial court granted the new trial was due to the defense’s persistent leading questions. The defense appealed the trial court granting a mistrial. With respect to leading questions, the appellate court held that the issue was not properly preserved for appeal because the plaintiff did not move for a mistrial at the time of the questions. The trial court ceasing the defense’s examination of a defense witness due to leading questions was a severe remedy that the plaintiff agreed to. The plaintiff did not make a contemporaneous motion for mistrial based on the leading questions, but rather, accepted the trial court terminating the defense’s direct examination. But, even if the plaintiff did contemporaneously move for a mistrial, the leading questions would not warrant a new trial because leading questions generally do not form the basis of error for purposes of an appeal.